I grew up with homemade dresses in the 70’s. I never minded until she started making my brother’s shirts to match my dresses. My little mind only saw her trying to make us match. It never dawned on me that she had bought the only fabric she could afford and was making as much use of it as possible. Your comment made me smile! I would have felt the same way and when we are “younger” we don’t have the capacity or eyes to truly “see.” Thank you for your comment. What a beautiful story. I love the positive spin you put on it all, while still showing the heartache underneath it all. Your description of your mother’s creation is gorgeous. My paternal grandmother was a dressmaker, and I have written about her work in the past and intend to do more in the future, so that and the fact that I always felt as if my clothes were much less than the other kids really rang some bells for me. 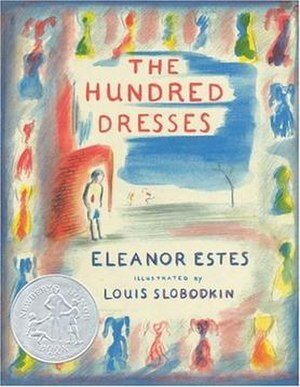 Also, I have a collection of Newbery and Caldecott books, but do not have and have never read The Hundred Dresses. It sounds amazing! Thank you, Luanne! Is your writing of your grandmother on your blog? Este’s story is beautiful, you must read it.